Jim Ziolkowski has long been the consummate manifestation of what Broad Spartans aspire to be. As founder of buildOn, the Eli Broad College of Business alum has used his business acumen to make a better tomorrow for others everywhere, from America’s urban cores to far-flung locales spanning the globe. Now, Ziolkowski is being hailed as a role model for all. Ziolkowski, a 1989 Financial Administration alum, is one of 33 business school graduates worldwide honored by AACSB International (AACSB) — the world’s largest business education alliance — as the 2019 Class of Influential Leaders, announced Tuesday, Feb. 5. The 2019 Influential Leaders challenge recognizes alumni — and the business schools that prepared them — who personify the role as a visionary figure or change agent. Collectively, the latest class (representing 13 countries) shares a demonstrated passion and dedication to lead or innovate within their industries, impact their communities and inspire future business leaders, according to AACSB. 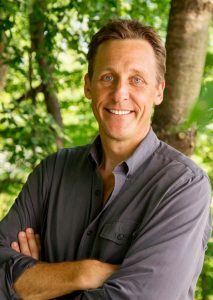 Ziolkowski left the Financial Management Program within GE Capital in 1991 to start buildOn where he created, managed and grew a nonprofit infrastructure that empowers urban youth to transform their neighborhoods through intensive community service, and to change the world by building classrooms in some of the world’s economically poorest countries. He enlists corporate partners to mentor students, share skills, and provide resources while at the same time exposing those partners to a broader worldview in their own communities and worldwide, according to buildOn. Each day more than 177,000 children and adults worldwide attend one of 1,351 schools built by buildOn in developing countries with the aid of 2.2 million volunteer work days. 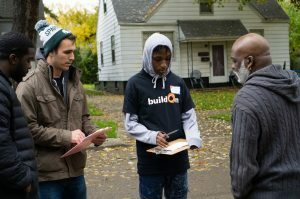 In the United States, the nearly 5,700 students engaged in buildOn programs each month have offered 2.1 million volunteer service hours to date in their communities with student participants graduating high school and attending college at a 97 percent rate, according to buildOn. “Jim Ziolkowski has blazed a trail of selfless servant leadership. Each part of the vision he has created for buildOn has the power to transform lives forever. Advancing knowledge and transforming lives is also the central mission of Michigan State University and that is how Jim truly embodies the Spartan spirit,” said Sanjay Gupta, Eli and Edythe L. Broad Dean of the college, who nominated Ziolkowski for the award. Ziolkowski’s group was able to retain more than three dozen major corporate partners to support and participate in its efforts. Those partners include some of the world’s biggest names in business including Google, General Electric, Citi, Goldman Sachs, J.P. Morgan, McKinsey & Company, Salesforce and NBC Universal, among others. 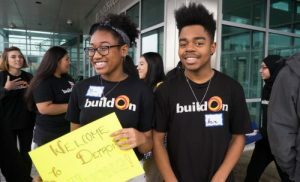 Broad MBA students partnered with Detroit high school mentors as part of a buildOn program in the Motor City in 2018. The first school in Africa built by buildOn was in Misomali, Malawi in 1992 with the hope of providing access to education for 150 students in a nation where the HIV/AIDS infection rate was up to 50 percent. Twenty years later, the village had constructed four more schools on its own, which allows more than 1,000 kids to attend school each year, according to buildOn. More than half of those students are girls, and now four out of five chiefs in that region are women. The prominence of girls in the community is a direct result of the investment in education by buildOn and the community itself that helps unlock their potential through opportunities initiated and cultivated by buildOn, according to the nonprofit. More recently and much closer to home, buildOn paired 86 members of the Broad Full-Time MBA Class of 2020 with Detroit high school students for a weekend-long immersive learning and volunteer opportunity where they flipped the traditional roles of mentor and mentee and giving the MBAs lessons on life from way beyond the C-suite. Detroit high school students who serve as buildOn mentors in 2018. Now in its fourth year, the Influential Leaders challenge has recognized almost 200 business school graduates for creating lasting impact in business and society. All honorees have earned an undergraduate, graduate or doctoral degree from one of the more than 800 AACSB-accredited business schools worldwide. Each of AACSB’s 831 accredited institutions were invited to nominate up to two of their outstanding alumni for consideration. Through its Influential Leaders challenge, AACSB is committed to highlighting and sharing stories of graduates who set an example as leaders within their industries and communities, according to the AACSB. Founded in 1916, AACSB leads the business education industry through quality assurance, business education intelligence, the sharing of best practices globally and professional development services.